It’s true that social media is in transition. Facebook Reach is at an all time low. Instagram has a new algorithm. Twitter is in flux. And the next Big Thing in social media Snapchat is baffling to many seasoned social media managers. But digital and mobile app payments are coming. The global internet population is set to triple in the next four years. The Internet of Things will transform our world. And email ROI and online giving is up, up, up! In reality, the peak years of email, online fundraising, and social media are ahead of us and the next decade will astound us all. 1. 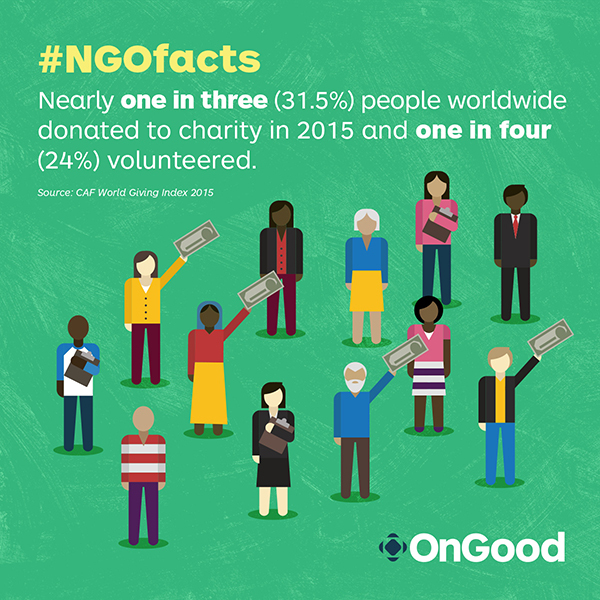 Nearly one in three (31.5%) people worldwide donated to charity in 2015 and one in four (24%) volunteered. 2. By 2018, the global population of social media users is projected to grow to 2.44 billion, or 33% of the world population. 3. 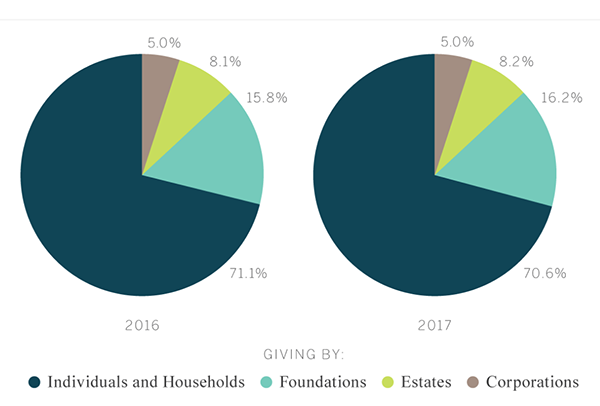 Total giving is expected to grow 4.1% in 2016 and 4.3% in 2017. The vast majority of the giving will be done by individuals. 4. Matures donate $683 annually. Boomers $478. Gen Xers $465. And Millennials $238. 5. 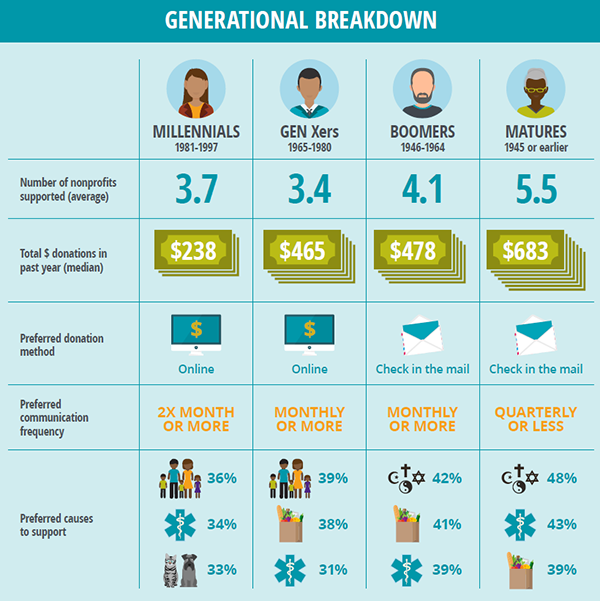 Donors 40-59 years old are now the most likely to give online. 6. 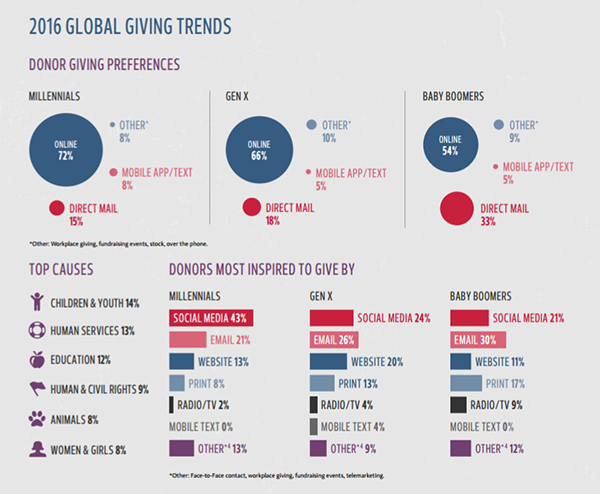 Millennials most inspired to give by social media. Gen X and Baby Boomers by email. 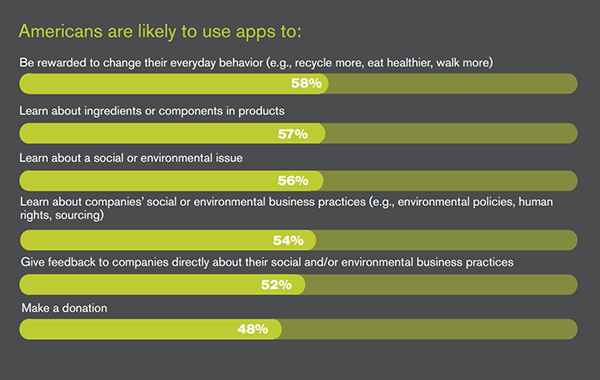 Prediction: Gen Z will prefer mobile apps. 7. 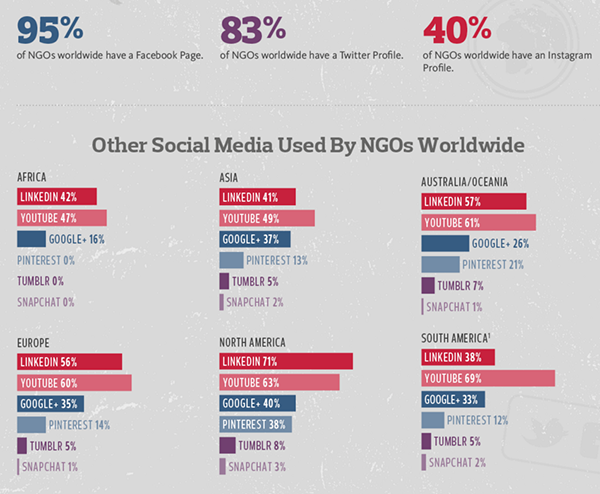 95% of NGOs worldwide have a Facebook Page. 83% have a Twitter Profile. 40% are active on Instagram. 8. 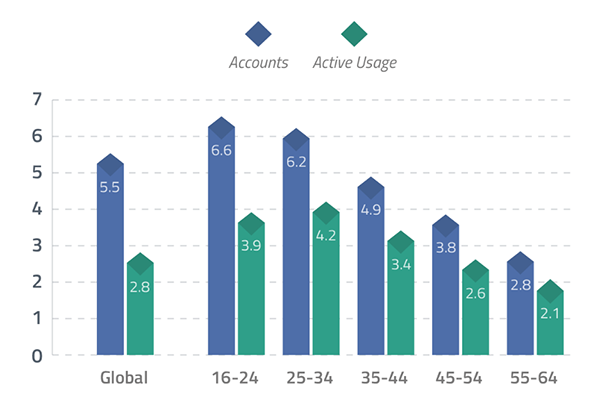 Internet users have an average of 5.5 social media accounts. They are regularly active on 2.8 of those accounts. 9. 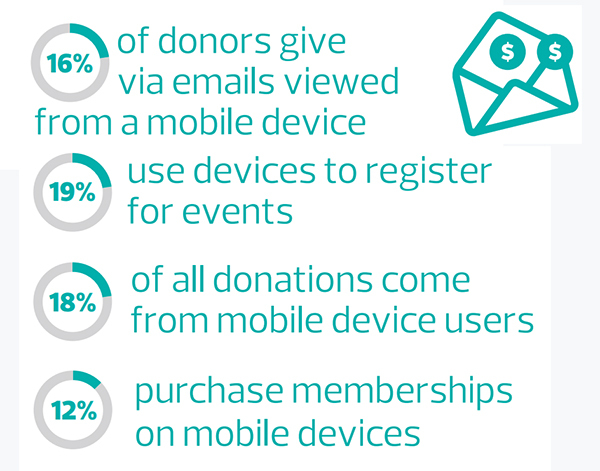 18% of all online donations come from mobile device users. 10. 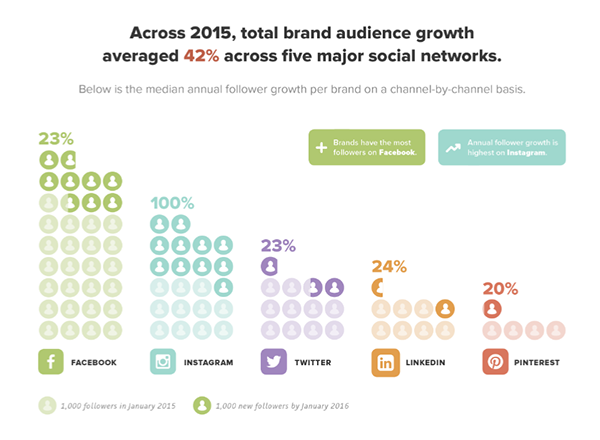 On average, your followers should grow 23% annually on both Facebook and Twitter. 11. 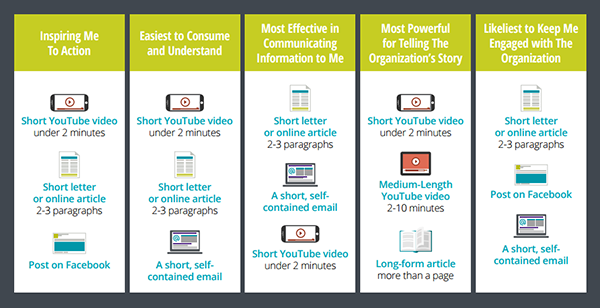 Short videos, short online articles, and short emails keep donors the most engaged, informed, and inspired to give. 12. 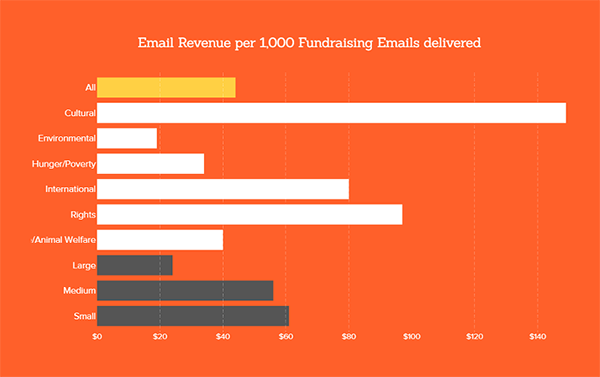 For every 1,000 fundraising emails delivered, a nonprofit raises $44. 13. 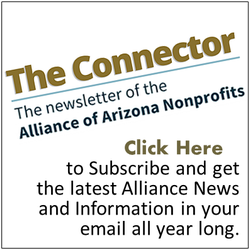 For Every 1,000 email subscribers, nonprofits have 355 Facebook follower, 132 Twitter followers, and 19 Instagram followers. 14. 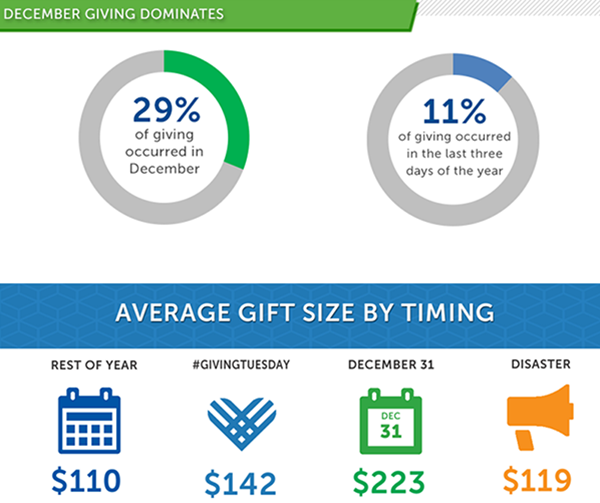 11% of all online giving occurs over the last three days of the year. 15. Given the opportunity, 48% of American adults would make donations within a mobile app. 16. 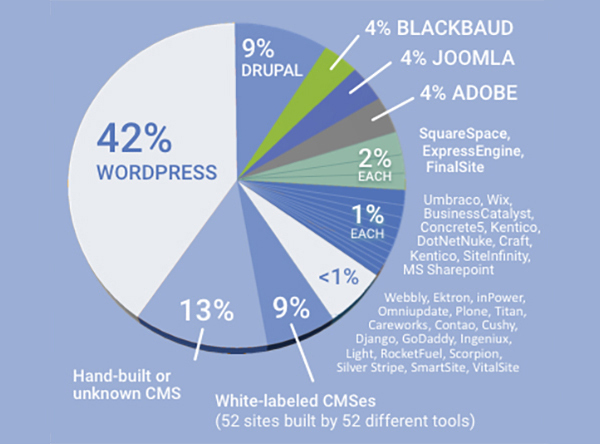 42% of nonprofits use WordPress as the Content Management System for their website. 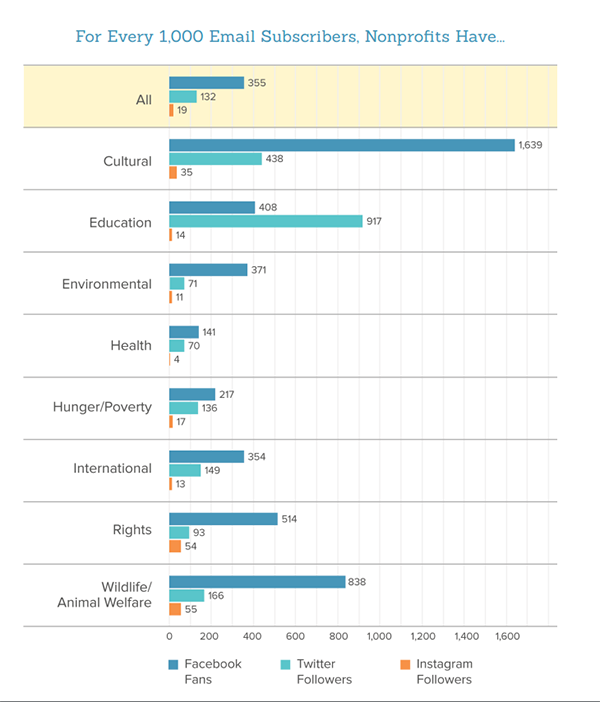 A collaborative research project by the Public Interest Registry and Nonprofit Tech for Good, the 2016 Global NGO Online Technology Report is based upon the survey results of 2,780 NGOs from Africa, Asia, Australia & Oceania, Europe, North America, and South America. The research is unprecedented and provides valuable insight into the global NGO sector and its use of online technology.